The BlackHawk! CQD Mark I Type E delivers precision performance. The AUS-8A stainless steel blade has a black PVD finish and a partially serrated cutting edge. 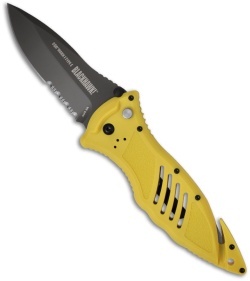 The yellow injection-molded, reinforced nylon handle has 420J stainless steel liners. The CQD Mark 1 Type E has the performance of an integrated button-lock locking mechanism and secondary safety. The recessed seat belt/cord cutter, and carbide glass breaker make this knife a must-have. 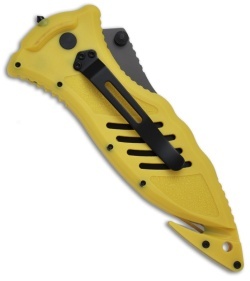 The pocket clip allows multiple carry options.